I've recently been listening to this particular organist, who strikes me as exceptionally talented, and as soon as I hear back from his web-site (run by his manager, his father) about a couple of pieces of music, I'm probably going to order them. For obvious reasons, I've never really paid much attention to organs; I've read in books about how a second person was needed to run the "billows," but never had any idea what that really meant. Of all the organs in the churches of small towns where I grew up, I don't ever recall seeing a second person hanging around, just the person sitting on the bench. This guy was appointed a church organist (Dutch Reformed) when he was sixteen years old, having learned to play the instrument from his grandfather. Many of the videos show he doesn't even use sheet-music; apparently he memorizes the music and plays it. The body language adds a great deal to the music, I think; he's very expressive. At least to me, it sounds very different if I'm simply "hearing" the music, as compared with watching it actually being played. I'm sure most will agree he's very good, but I'm no professional critic. Is this guy very good, or is he truly remarkable with the organ? It's all a matter of opinion, of course. I think it's awesome. 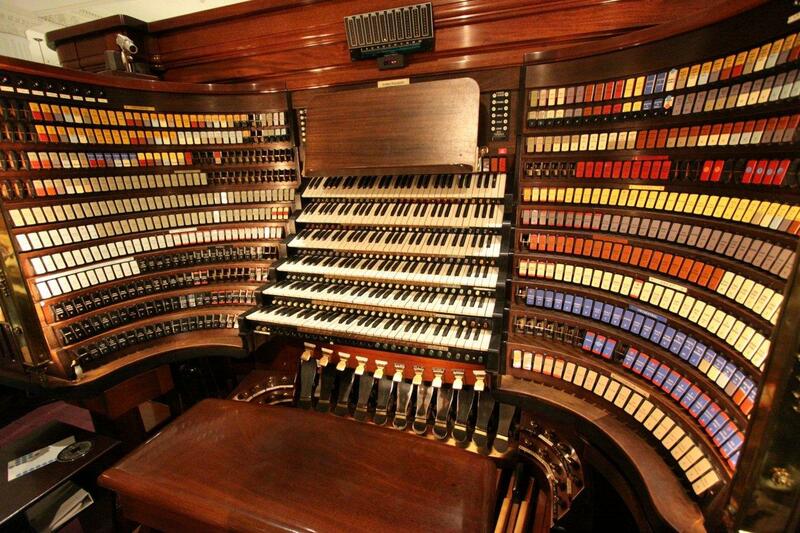 I'll fill - in until an organist replies! Early console organs were air-powered using a leather "bellows" mechanism, not unlike a smithy's bellows. The organist played while one or more persons pumped the bellows to maintain the air volume necessary to feed the multiple pipes in the church. There were early organs with limited pipes with the organist using his feet to continually pump two foot pedals to maintain air. Nowadays the air is pumped by electric motors. My God, she's good. Thank you. I "listened" to her youtubes for like about three hours straight. I'd never heard of her, but she's awesome. I'm no organist either, but I've heard some damned good ones over the years. This young man is promising, I'll grant you, but I think he rushed the tempo in the "B" section just before the coda. Not enough to crash and burn, but it was noticeable to my internal metronome. The first piece, written by Jeremiah Clarke, is classic Baroque and a staple for trumpet and organ. It's often played in weddings as a processional or recessional. My fave organist is E. Power Biggs. He was one of the greats playing Bach, but yeah, Virgil Fox was every bit as good in a very flamboyant way. Fox would go on the road carrying his electronic organ with him packed up in a tractor-trailer rig or somesuch and play venues like Fillmore East. Why is it that most male organists I've encountered are gay? Actually there's a story here, but I'll try to keep it short. A few years ago, right here on this message board, I asked our good friend Eupher why, since the harpsichord was already in existence, had it been necessary to invent the piano? I was insisting that the piano was a more primitive, a more backward, a cruder, coarser, sort of instrument, as compared with the harpsichord. This was because at the time (say, seven or eight years ago, when I inquired of Eupher), the harpsichord was one of the very few musical instruments I could hear with any degree of certainty (all deaf people can "hear" something, although what we "hear" differs). I could "hear" strings being plucked, but not strings being hammered. I paid no attention at all to the piano until I was well into middle-age and had suffered a heart-attack. Because I needed some diversion in my crippled state, an audiologist and some other friends, through trial-and-error, wired the internet and my head in such a manner where I could "hear" things rather more than stringed instruments. This has all taken place only within the past twenty months. Every time I go to youtube I'm discovering something utterly new to me, even though others have been acquainted with such sounds since infancy. So I suppose it's sort of to be expected that franksolich acts like a chlld, or at least a juvenile, when bringing something over from youtube. It's really and truly new to me, and I'm heartened that I don't seem to have even scratched the surface yet; there's always some delightful surprise around the corner. Alas, as I learned directly from her, nearly all the pieces I like best are "owned" by wherever she played them, and not by her......and nearly all those don't offer them in CDs or DVDs. Of Polish derivation, she's currently head organist at some famous medieval cathedral over in Spain--and hence her use of Spanish. Agreed on the "dainty" quality and for purposes of chamber music when such dainty qualities are preferred rather than the power of a Rachmaninoff concerto or the avalanche of notes of a Saint Saens, the instrument does have its place. In Baroque music, the harpsichord is sometimes relegated to that of the continuo/basso continuo. Of a more modern era, I think of Morticia Addams and her playing the harpsichord. Gotta love that, Goth and everything! Now that I think about it, the "dainty" quality applies especially to the physical construction of the harpsichord itself. Very difficult to keep in tune, especially when it's moved.